KILMARNOCK COLLEGE managers are confident that plans for a new £40million campus will go ahead, despite a Scottish Funding Council delay to the project. The SFC’s Capital Investment Committee has told the college that cash is not available under the current spending review covering the period until 2011, despite agreeing to the need for the new building and praising the college’s outline business case. The outline business case included a number of options: for the rebuilding of the college on a new site, the rebuilding of the college on the existing site or a redevelopment of the existing building. The SFC committee acknowledged that an appropriate plan should be put in place, but has asked the college to delay submission of a final outline business case until a new Principal is in post and planned management development is in place. Stephen Brannagan said: “We expect to announce the appointment of a new Principal in September, with the successful candidate taking up his or her position by the end of the year. The new management team will be in place by the end of September. “Whilst we are disappointed at the delay, we believe that the work we have already undertaken on the project will stand us in good stead when the SFC are in a position to make funds available for the further development of our plans. We would expect to resubmit our outline business case in early 2009. “Our original estimates saw the appointment of a construction company by 2010 and completion by 2012. This latest news would only delay us by an estimated 12 months. 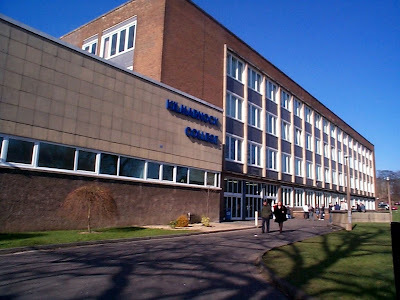 “The new management team at Kilmarnock College is determined to present the strongest possible case over the coming months for a new college designed to fulfil the needs and aspirations of learners in Ayrshire in the 21st century. “We have made giant strides over the past year to improve both the management procedures and educational opportunities within the college, and we look forward to a bright and successful future at the heart of Kilmarnock’s planned regeneration. “The Funding Council committee have accepted the need for a new college, and have praised our outline business case, so we are disappointed that funds are not available at this stage. The people of Kilmarnock and the surrounding area need and deserve a modern further educational facility to help revitalise its social and economic development. Speaking on West FM Radio, Scottish Funding Council interim chief executive Lawrence Howells said the delay was “not a big problem” and that projects of this nature would normally take about two years in the planning stages. There are currently 313 Ayrshire business stories permanently archived on this site. To locate those of most interest to you, please use the site search facility in the top left hand corner of this page. Type your search term in the white box, then click “SEARCH BLOG”.